Keter: Commitment to innovation & award-winning design for over 60 years. Keter Plastic is one of the world’s leading manufacturers of resin-based household and garden consumer products. Driven by innovation that responds to consumer insight & feedback, Keter delivers an impressive range of furniture, storage and organisation solutions – for all. Each and every Keter product is thoughtfully engineered to combine the durability of plastic, attractive design and unparalleled functionality. Their ongoing commitment to simplify and enhance the daily lives of consumers, has been key to their global success. Keter outdoor plastic sheds provide a variety of solutions for all of your home and garden storage needs. 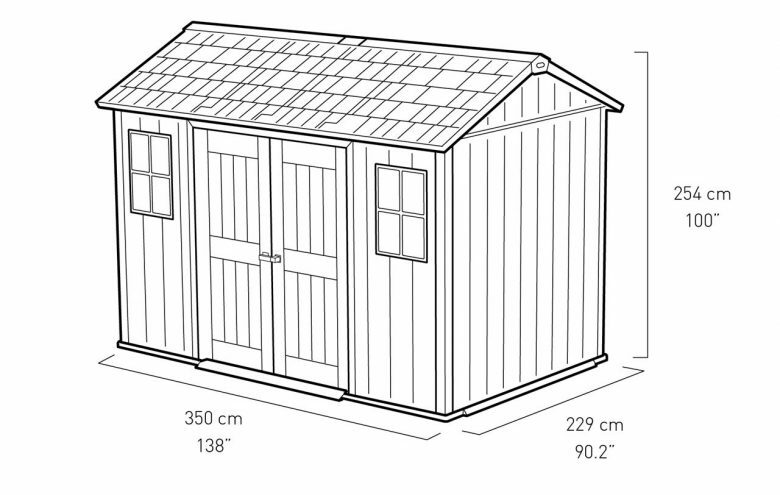 The sheds are available in a range of sizes and designs to suit your available space. 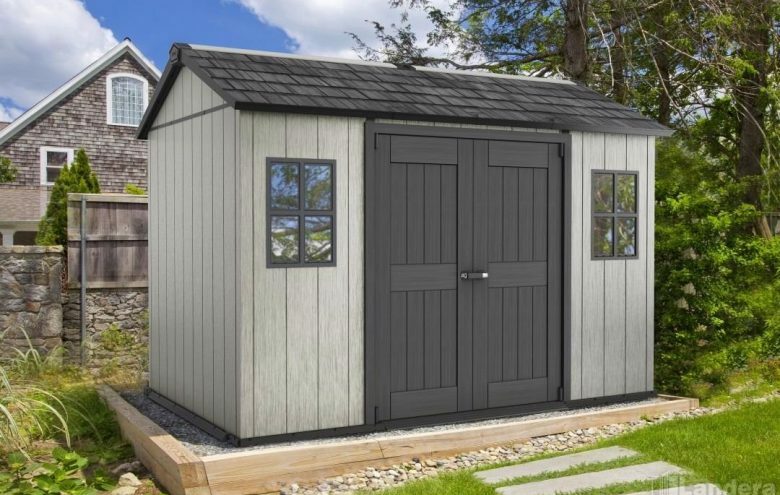 These include large sheds that are ideal for storing everything from garden tools to bicycles – or more compact space-saving plastic sheds that enable you to store your tools and accessories. 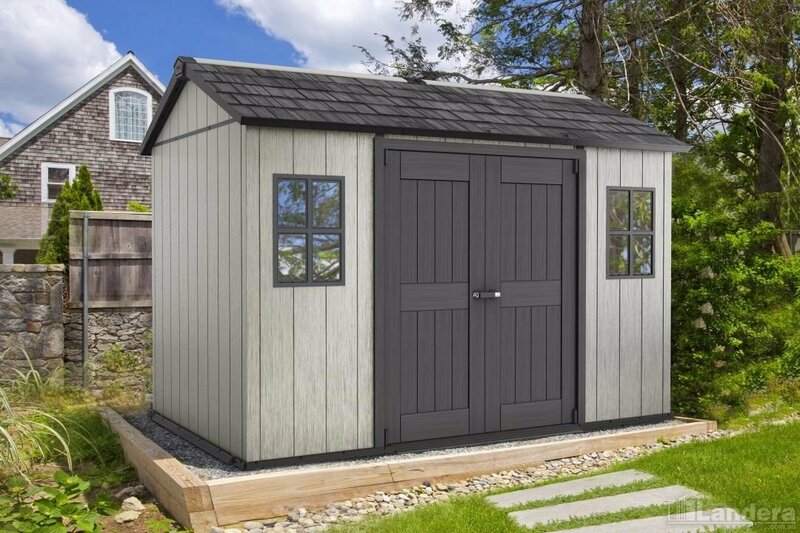 Outdoor plastic sheds are becoming very popular due to their durability, ease of assembly, and weather-resistant structure. There is no need for maintenance, and your stored items will remain dry and secure in a plastic shed. 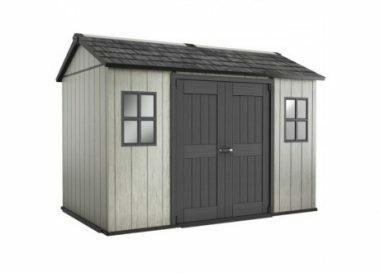 Choosing a shed is made easy with the Discountsheds.com.au range of Keter’s plastic outdoor sheds. 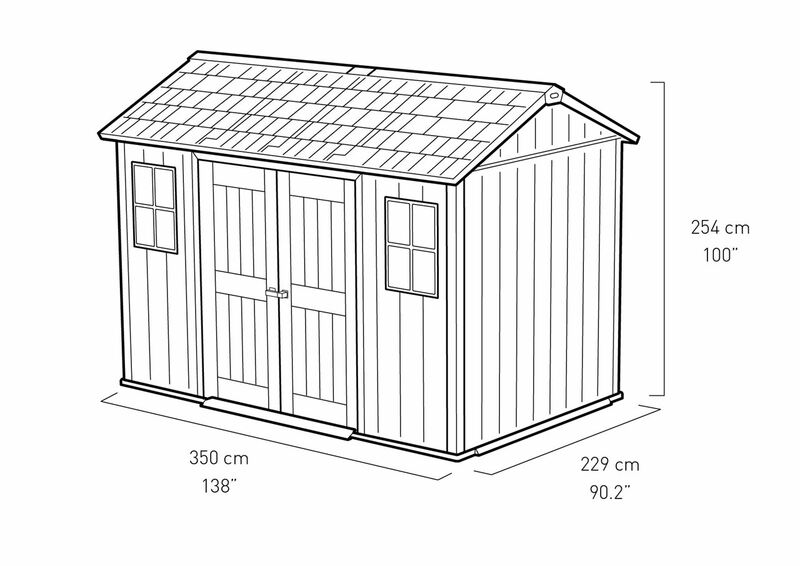 Vertical and horizontal-shaped sheds can easily slot between or underneath other items, if necessary. All Keter’s plastic sheds come in attractive neutral colours, and the rattan-style line offers you an additional sense of style for your outdoor. What Is Polypropelene (Thermo Plastic Polymer)? Keter products are made from high impact / high density, durable, maintenance free, UV stabilised polypropylene (a composite thermo-plastic polymer resin), using advanced injection-moulding technology. √ Many options & standard feature inclusions (model dependant) – e.g. windows, built in skylights, ventilation grids etc. √ Custom moulded & integrated extruded plastic floor – no specific need for timber or concrete bases. There are pre-drilled access points to allow fixing down to your existing ground / timber/ paving / or concrete substrate. √ Portability – Can easily be moved (depending on the shed size – intact as a whole or in disassembled wall sections). Oakland is the only resin shed you can paint. The Keter Oakland shed is maintenance-free resin shed made of a unique compound which enables the wall-panels to be painted. The shed can be used in its original colour, or the walls can be painted to match your landscape, deck, patio, or outdoor setting. Type of paint: The walls of the shed can be painted with a water-based acrylic paint for exterior use. Recommended: Solid, light shades, satin or semi-gloss finish. Consult with your colour consultant or paint professional when choosing paint. Application: Use a roller to apply the paint on the wall surface. Do not paint the beam-like cervices in the walls. Do not paint windows, doors or door beam, roof, floor, or any other part of the shed. Keep in mind: Painting requires maintenance. After some time, repainting may be required. Roof Line: Gable roof - with gables in the front wall above door. Steel reinforced. Shingle/tile style finish. Colour swatches are shown in the order completion section of this product page. Please note: the finishes shown have been reproduced to represent actual product colours as accurately as possible. However this representation may be subject to the limitations of web palette colours, or your screen & printers settings. These may affect colour tones. Before any purchase is made, please check with your local authority to determine and understand any building approval or product wind rating compliance requirements, that may exist (at your installation address). Where applicable, all building approvals should be attained before any purchase is concluded. All products are stored & held by the distributor, in Brisbane, for dispatch and nationwide shipping. For estimated dispatch and freight consignment time frames – please refer to the “Availability” section in the “Specifications: Snapshot” tab of this product page. Note, this advice is an estimate only and is the most current notification as provided by the manufacturer. This estimate may vary and be subject to change. Unforeseen or unadvised production or dispatch circumstances, experienced by the manufacturer, may occur. The estimated number of working days shown, is for the manufacturer to dispatch the ordered item(s). Allowance needs to be also made for the delivery (shipping & handling) of the order, by the manufacturers’ contracted freight carrier. Delivery times vary based on freight company handling volumes, the ordered product size and delivery destination. The manufacturer will ship your order to your nominated address, for a small fee. This varies and is based upon the product ordered, its weight, volume, configuration and the delivery destination. The fee for paid home delivery is calculated and shown for your consideration, during the ordering process, before you decide to add the order to the online shopping cart & complete your purchase. Upon arrival of your order at the freight carriers regional distribution centre closest to your destination address, they will call and make coordinated delivery arrangements with you. The customer, or their arranged & authorised nominee, is to be present to receive and sign for the delivery. All home deliveries are to the front of the property only. They do not allow for placements down the side or the rear of the property. Selecting Paid Home Delivery is the customer’s acceptance of the terms and conditions as they pertain to the delivery of this product(s). The delivery address must offer appropriate access for a tailgate truck, so that the delivery can be completed. Delivery of Garden Sheds & Aviaries are Assisted Deliveries. This means that there must be an able bodied person present at the coordinated time of delivery, to receive the order and may be requested to assist the delivery driver, with the unloading of their order. If there is any failure in meeting these agreed conditions, additional delivery and handling fees may be incurred. Charges from $90+gst may be levied by the freight carrier, if the coordinated delivery cannot be completed. Where applicable, this impost will be charged through to the customer. I've Placed My Order - What Now? Once your order has been reviewed, processed and completed by DiscountSheds.com.au staff, the manufacturer receives all order details and commences the dispatch (or where applicable) the production process. For estimated dispatch time frames – please refer to the “Availability” notice in the “Specifications: Snapshot” tab of this product page. Note, this advice is an estimate only and is the best and most current notification as provided by the manufacturer. This estimate may vary and be subject to change where the manufacturer may experience unforeseen production or dispatch circumstances, which may result in extended times required to fulfil an order. Upon dispatch, your order is consigned to the manufacturers’ contracted national freight carrier for handling, distribution and delivery. An allowance also needs to be made for the time required for the handling and delivery of the order. Delivery times vary based on the freight companies handling volumes, the ordered product size and delivery destination. Once you order arrives at the closest freight distribution centre to your location, the freight carrier will call to to co-ordinate with you the home delivery arrangements. It is extremely important that attention is paid before you sign for and receive the goods. Signing for the goods denotes the customer has received all goods as ordered & that they are in a good and fit condition. Even though great care is exercised by both the manufacturer and their freight carrier and agents, in some circumstances, the goods may either be damaged in transit, or be issued in error or incomplete. √ Check the box labels to verify that all the boxes that make up your model no. are presented. Box labels will show how many packs make up that model. For example – The box label will shown the Model No. & then state that the particular box is number __ from a total of __. If the label says that the box you are looking at is pack 1 of 2, then there should be a second pack. Please check that second box/pack to ensure it is the correct one for the ordered model, by checking the model number shown. Within thirty (30) days of the receipt of the goods, you should inspect the product(s) in its entirety. The inspection is to satisfy that the product is in sound condition & is complete. You must notify discountsheds.com.au (the retailer) of any fault, damage or shortages of the goods and their component parts. We will then contact the manufacturer and lodge your claim request, along with our instruction for timely corrective measures, where required. Do not attempt to assemble the product until you are in possession of all required components. This is ascertained by following the manufacturers’ written general instructions in the assembly manual. Carefully unpack the carton(s). Identify and check off the included parts and components against the parts illustrated and described in the manual. Partial and incomplete assembly (whilst waiting for the supply or re-supply of any reported missing or damaged parts) may result to damage to the structure, for which the retailer and the manufacturer are not responsible for. The email is to reference your Discountsheds.com.au Tax Invoice/Receipt Number (as emailed to you by Discountsheds.com.au upon processing of your online or phone order). Note this is different to the automatically generated web order ID. It allows us to identify your order & index it to the manufacturers reference number for your transaction. The email is to list any and all, missing or damaged parts that require reissue or replacement (tabled in one item of correspondence). This information must be sourced & noted from the products assembly manual components list, as follows: Quantity, Part Description, & Part No. If a claim is being made for parts that are damaged, the manufacturers require photos to be attached to your email, that clearly show the damage referred to. Please include adequate detail in the photos for the manufacturer to review the nature and extent of the damage. Photos from afar ( a few steps back showing damages to packaging or material), as well as close up detail, to show damage to parts – would be ideal. These submissions are requested & required by the manufacturers. It is important for their quality assurance program and where applicable, their possible freight insurance claims.